Small Request for You:Could You do a PBY Cataling in the Marking of the World Aquanaut Security Patrol Please? Say, Can You Do This? I Know It's A Lot, But There's Nothing That Master Billy "WS" Clave Can't Do Right? Perhaps a Hawker Hunter in Israeli Air Force colors around 1967? 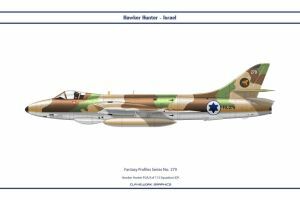 OK - Part 279: Hawker Hunter FGA.9 of 113 Squadron IDF. Oops...I forgot about that. You got so much cool stuff, it's sometimes overwhelming to remember them all, lol. How a Fairchild A-10A Warthog in Arizona Highway Patrol? A condor of the ROK air force, please. Can we see some nice Citroëns in the future? 2CV, Traction Avant, H Van, DS, SM, you know, design classics like that? Back to the list however . . .
. . . I'm thinking we're waiting IRL to see a Trump Administration "Make America Great Again" Mikoyan-Gurevich MiG-29A or T-34 tank (on loan from his buddy Putin . . . who he doesn't know.) can we project what that's gonna look like in the meantime? lol - I will have to think about those two! I would like an F/A-18E Super Hornet in the colors of the Royal Malaysian Air Force, please. Umm, don't they have Hornets in real life? Oh well, then change it to the blue multi-tone camouflage of the JASDF. How about a MiG-25PD in Cuban, East German and North Korean colors? How about an Albatros D.5 in Taiidan markings from Homeworld? I would like a BAe Harrier GR3 in colours of the Luftwaffe, Post war era like the green camouflaged tornado, please! For fantasy, would you be able to illustrate a Boeing-Vertol 234LR in the markings of a transport helicopter from The Lost World: Jurassic Park? not sci-fi, but perhaps a RCAF F-35 as well. All good - I will add Canada randomly to some planes and spaceships - because you know Canada is my 2nd favourite country. My first favourite country, but I'm probably a bit bias haha. I discover you few weeks ago, I see that X-Wing and Y-Wing are back !! Thank you so much... If tou don't have an idea of a new starfighter, I can suggest you an A-Wing (green leader ?) or a B-Wing from the Return of the jedi, but of course you are the Decision-maker I hope you earn money correctly, you have to spend a lot of time and this is not easy, may the force be with you for the future.